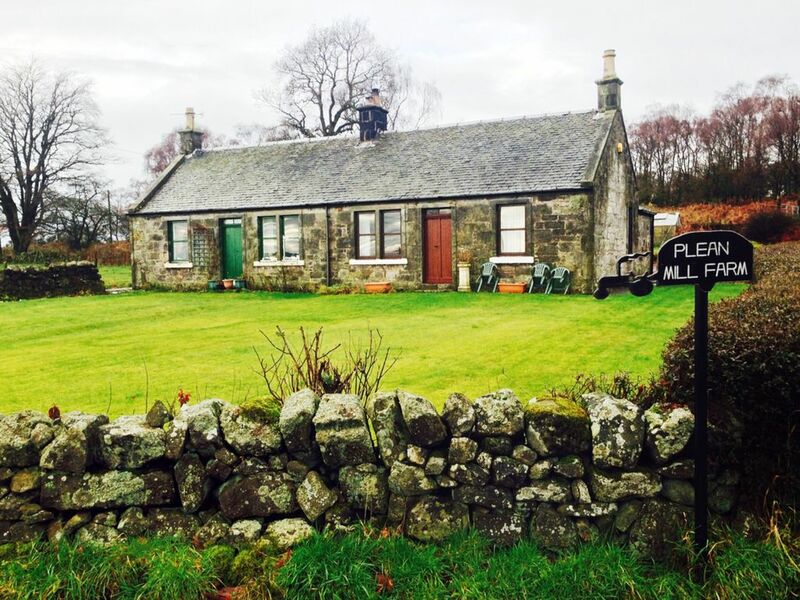 Peacefully situated on a quiet country road with lovely open views over the rolling farmlands of the Forth Valley, this semi-detached cottage is the perfect base for exploring Central Scotland and the Highlands or enjoying the tranquillity of life in the countryside. Whilst retaining the original farm cottage exterior the property has been sympathetically modernised and is freshly decorated and comfortably furnished. There are front and rear gardens with outdoor furniture to sit out and enjoy the scenic surroundings. All accommodation is on ground level and there is secure storage for cycles or sports equipment. Within easy reach are Stirling with its historic castle and Wallace Monument, Bannockburn battlefield, the vibrant city centre and waterfront of Edinburgh, the unique Falkirk Canal Wheel and the lively city of Glasgow. Easy day trips are Loch Lomond, the Trossachs, St Andrews and the picturesque Fife coast and the lochs and glens of Highland Perthshire. There are lovely countryside footpaths and quiet roads to explore on foot or by cycle all around and good golf courses nearby. The village of Airth (2 miles) has local shops, pub and luxury hotel. 1 double and 1 bedroom with adult bunk beds (cot available), bright lounge/dining room, well fitted kitchen, bathroom. All electric. Fridge/freezer, washing machine, microwave, television, video. Bed linen and towels provided. Rents inclusive of electricity. Hi My name is Sonja and I am very lucky to live at a 14th century castle near the cottage. Wished we could have stayed longer, the property is a lovely cosy cottage in a peaceful surrounding. Welcoming owner who made us feel very comfortable. Would certainly think about staying here again. We had a lovely time, weather was kind, neighbours friendly and helpful. Lots to see and do in the surrounding area. Don't miss Falkirk Wheel or Bannockburn Museum. The property itself was a lovely cottage rather dated interior and not the best equipped. A bit hotch potch, and being the start of Autumn lots of spider webs. I threw out some items left in the cupboard which were well past sell by date and had to clean the frying pan before use-and then it stuck badly. I had concerns about the bathroom floor and a damp patch on the living room ceiling. Some repairs needed, I think. However, it was warm and cosy and good for dog walking. Great house. We were 3 people and felt very comfortable in the house. Their is a fantastic garden out the front and back and the neighbour's are really lovely and happy to help out. Sehr schön und ruhig gelegenes Cottage.Leider schmutzig angetroffen. Das ganze Cottage hätte eine gründliche Reinigung nötig. Zum Teil funktionieren die Heizlüfter nicht. Fenster liessen sich z.t. nicht öffnen (mit Farbe verklebt). Die Haustüre hat ihren eigenen Scharm damit man sie verschliessen kann. Auch das komplette Inventar hat schon einige Jahre auf dem Buckel. Erstaunlicherweise haben wir sehr gut geschlafen in den Betten. Die Lage ist wunderbar, die Aussicht prächtig über die ganzen Felder und sehr ruhig gelegen. Man sollte das ganze renovieren. Die Dusche ist das Beste im ganzen Haus. Cleaning and service was sub standard. The cleanliness in the house was to say the least very bad. layer of grease on top of the kitchen cupboards,Toilet brush still fouled from previous users. (had to leave it in bleach for a day).corners of the rooms and behind cupboards and beds very dusty with old cobwebs.Did,nt look like the windows had been properly cleaned in a while.Had to thoroughly clean the vacuum before we could use it. No wifi although in the instruction book in the house it was stated that bt wifi was available at a cost. Oddly enough we are not that fussy. It doesnt matter to us if the house needs a lick of paint here and there. Or that theres a mish mash of cups and plates ,however cleanliness and hygene do. We pay to have the house cleaned and therfore expect it to be clean when we arrive. In our opinion some one needs to check this house very thoroughly on a regular basis. We are not sure that this happens. We are very surprised that you have left such a negative review especially when you had every opportunity to express your concerns during your stay. The cottage is cleaned to a high standard and when you informed us of an issue with the TV and a lightbulb this was dealt with immediately. If you were concerned about dirt "on top of the kitchen cupboards" during your stay we would have dealt with this just as quickly. In order to clean on top of the cupboards we would of course have needed to bring a step ladder but this would not have been an issue for us. The toilet brush is cleaned in between each set of guests and replaced on a regular basis. Your review is unfair and unnecessary as you had every opportunity to highlight these minor issues to us during you stay and if you do not let us know there is an issue how on earth are we supposed to deal with it.